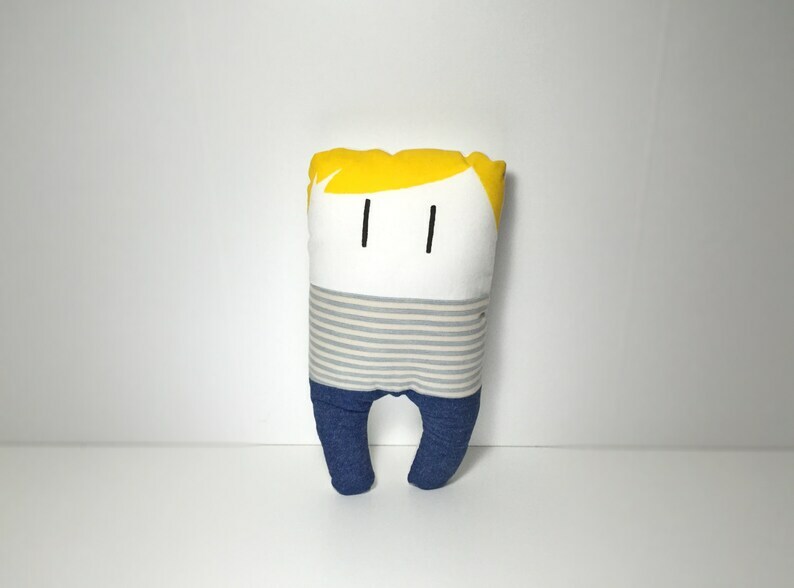 Say hi to Martin, a handsome blond guy wearing a light blue and white stripes shirt and a pair of jeans. He measures about 25 cm (10") height and 11 cm (4") width. Made from new and vintage cotton fabrics. Stuffed with non allergenic polyester stuffing and carefully hand painted with permanent, non-toxic, acrylic paints. Can be used as a toy or ornament. Each plush comes in a handmade drawstring bag. Gently hand wash. Do not iron. No buttons or detachable parts that might constitute a choking hazard. This is a ready to ship item. Please note all my items are handmade with care, by me, from my original patterns. They can not be fully tested according to the guidelines for soft toy makers as they are not toys of mass production.